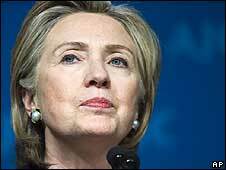 US Secretary of State Hillary Clinton has issued a strong warning to Syria over the alleged transfer of sophisticated weapons to Lebanon. 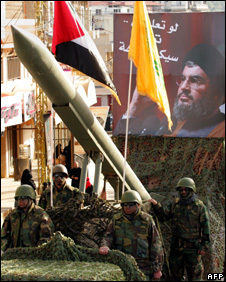 Two weeks ago, Israel accused Syria of supplying long-range Scud missiles to Hezbollah, the Lebanese guerrilla movement and political party. No evidence has been offered for the allegations by the Israel or the US. Damascus and Beirut deny this, saying Israel is trying to set the stage for military "aggression". Hezbollah fought a 34-day conflict with Israel in 2006 during which more than 1,200 Lebanese people, mostly civilians, were killed. Some 160 Israeli people, most of whom were soldiers, also died. UN Security Council resolution 1701, which ended the conflict, included an arms embargo on Lebanon, except for transfers authorised by the Lebanese government or UN. Mrs Clinton warned, in a speech in Washington to a Jewish lobbying organisation, that weapons transfers could spark new conflict in the Middle East. She also warned that a nuclear-armed Iran would profoundly destabilise the region. "These threats to Israel's security are real, they are growing and they must be addressed. Transferring weapons to these terrorists, especially longer-range missiles, would pose a serious threat to the security of Israel, it would have a profoundly destabilising effect on the region and it would absolutely violate UN Security Council Resolution 1701, which bans the unauthorised importation of any weapons into Lebanon." Ties between Syria and the US had been tense since the killing in 2005 of Rafik Hariri, a former Lebanese prime minister. His assassination was blamed on Damascus - which denied any involvement - but Washington withdrew its ambassador shortly after. The White House has recently been trying to engage diplomatically with President Bashar Assad and has appointed a new ambassador to Damascus, although his nomination is on hold in the US Senate. "President Assad is making decisions that could mean war or peace for the region," Mrs Clinton said. "We know he's hearing from Iran, Hezbollah and Hamas. It is crucial that he also hear directly from us, so that the potential consequences of his actions are clear. "That is why we are sending an ambassador back to Syria, there should be no mistake, either in Damascus or anywhere else, the United States is not re-engaging with Syria as a reward or concession. "Engagement is a tool that can give us added leverage and insight and a greater ability to convey strong and unmistakably clear messages aimed at Syria's leadership," the secretary of state said.